Copy.com is currently my favorite cloud storage service. It offers 15 GB free space in the cloud. I think its currently the biggest storage available for free out there. 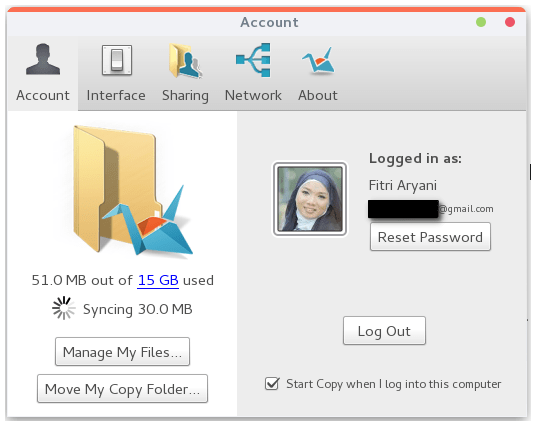 Copy.com comes with a handy client application which can be easily to connect and manage our files stored in Copy.com server. This tutorial is going to show you how to install Copy.com client application on OpenSUSE 13.1. If you are running Ubuntu and derivatives, you can read this tutorial to install Copy.com client application via PPA repository. Click this link to download the Copy.com client application from the official website. Right click the file Copy.tgz you’ve just downloaded and select Extract here. Or you can also use this command to extract it. This step will produce a new directory called copy. If you are running 32 bit OpenSUSE 13.1, use the x86 folder and if you are in 64 bit, use the x86_64 folder. Right click the file CopyAgent and select run to start using it. Enter your login credentials to log in.